A few months ago, a MousePlanet reader reported discovering some interesting code on the runDisney website hinting at a Star Wars race was being planned for the Walt Disney World Resort. Today that rumor became reality when runDisney officially announced an East Coast edition of the Star Wars Half Marathon weekend. As suspected, the Florida offering is themed to the "Dark Side" of the force, where the California race is all about the Rebels. The “Star Wars Half Marathon – the Dark Side” events are scheduled for April 14–17, 2016, takng the place of the Expedition Everest event, which had its final run this spring. As expected, the new event will offer a combination (6.2-mile) 10K and 13.1-mile half-marathon challenge division. 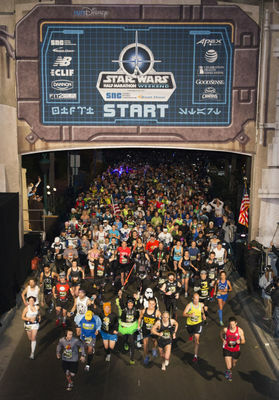 It was a given that any new event would also feature its own coast-to-coast challenge to encourage runners to sign up for both the Disneyland and Walt Disney World Star Wars races. Surprisingly, there was no marathon-length (26.2-mile) race planned for Walt Disney World. runDisney only offers one marathon race each year, but some had hoped the new Star Wars event would provide Disney with a great opportunity to add a second marathon to the schedule, and further differentiate the California and Florida events. Registration for the Walt DIsney World event opens September 22. If you have already registered for the Disneyland Resort event, you're set for the coast-to-coast medal. If you decided to skip the California event next year but now simply must find an entry, several charity groups still have spaces open for the Star Wars event at Disneyland in January. If you'd like a recommendation as to which charity to work with, several MousePlanet staff members register for runDisney events through Team Muscle Makers for UCMD, an official runDisney charity partner organized by MousePlanet reader Melissa Mayorgas. We checked with Melissa after this announcement, and she confirmed that the group still has space for the 10K and half-marathon events, but only one spot left for the Rebel Challenge. Visit the team website for more information. runDisney will franchise the popular Star Wars Half Marathon weekend in Walt Disney World. Photo (c) Disney. Jedi and Sith Lords who dare to experience both Star Wars races will have the chance to take on the Kessel Run Challenge — completing the Star Wars half marathon missions on both coasts. Kessel Run Challenge runners can earn a commemorative "Coast to Coast'' medal inspired by the Millennium Falcon starship. Race registration opens Sept. 22 at www.runDisney.com.